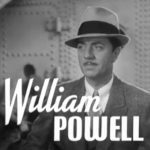 In Libeled Lady, Bill Chandler (William Powell ) is one of America’s great anglers, a sports fisherman without peer, doom in waders to the wiliest trout. And that isn’t the only fish story Chandler tells. 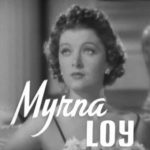 Four of Hollywood’s greatest stars – Powell, Jean Harlow, Myrna Loy and Spencer Tracy – reel in this whopper of a screwball romantic comedy classic nominated for a Best Picture Oscar. It all starts when society diva Loy slaps newsman Tracy with a libel suit. Tracy enlists fiancée Harlow and down-on-his-luck Powell in a counter maneuver involving a rigged marriage, a phony seduction, a fabulously funny fishing scene, fisticuffs, broken promises and hearts, and, eventually, true love for all. Connie Allenbury (Myrna Loy, The Thin Man). 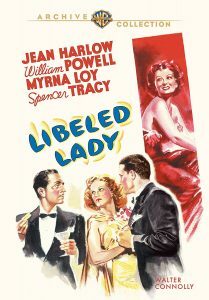 The Libeled Lady of the title. The wealthy socialite is falsely accused of breaking up a marriage. And she sues the New York Evening Star newspaper for $5,000,000 for libel. Bill Chandler (William Powell, My Man Godfrey). Warren’s former reporter and suave ladies’ man. Together, they plot a blackmail scheme. Maneuver Connie into being alone with him when his wife shows up. So that the suit will have to be dropped. 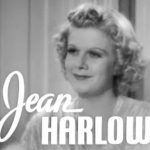 Gladys Benton (Jean Harlow, Bacon Grabbers). The only problem is, Bill’s not married. So Warren volunteers his long-suffering fiancée, Gladys, to marry Bill in name only. Over her loud protests. Newspaper comedy doesn’t seem like an MGM genre–ink-stained wretches don’t go with Adrian gowns and white deco furniture–but Jack Conway, the designated bull in the Metro china shop (Boom Town, Too Hot to Handle) does what he can to bring some dash and flair to a wildly complicated script. 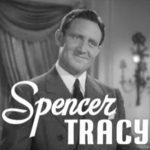 Spencer Tracy is the tough city editor who goes to some spectacular extremes when socialite Myrna Loy files a $5 million libel suit against his paper for calling her a notorious home-wrecker; he hires celebrated ladies’ man William Powell to seduce Loy and asks his long-suffering fiancée, Jean Harlow, to marry Powell temporarily so she can play the wronged wife when Loy and Powell are discovered together.